Are pop-ups passé? Many would argue yes, and even the "pop-up king" himself Ludovic Lefebvre has shunned the term. Alma (Spanish for "soul"), however, is breathing new life into the concept. The series is the brainchild of Chef Ari Taymor, who aims to present his brand of "nostalgic modern American cuisine" in a prix fixe setting, serving roughly seven courses at a very reasonable $55 per head. Alma kicked off in February, housed at Flake in Venice. It then moved to The Brick House in March (also in Venice), while this current iteration runs through May 27th at Millie's Cafe in Silver Lake. About the Chef: The nephew of noted Broadway director Julie Taymor, the NorCal native began cooking due to an interest in local and sustainable agriculture. He cut his teeth here in LA, but really started making a name for himself back up in the Bay Area starting in 2007. Taymor worked under Steve Jaramillo at Lalime's in Berkeley, then helped Tom McNaughton open Flour + Water in 2009. After a year there, he left and spent several months at Bi-Rite Market, learning the art of butchery with meat master Morgan Maki. This was followed by a stage at Armand Arnal's La Chassagnette in Arles, France, a completely self-sustaining restaurant situated on a farm. Upon returning to the US, he cooked for Chris Kronner at Bar Tartine, then relocated to Sausalito in 2011 to assist mentor Kimberly Alter in the opening of Plate Shop. After Alter departed the restaurant in May last year, Taymor became Executive Chef at Paul Cocking's longstanding Gabriella Cafe in Santa Cruz. From there, he moved down to Southern California, landing at Santa Monica's Salute in October. The Chef's tenure there was short, however, as he quickly left the place after an ownership change this February (the restaurant has since been relaunched as Brick + Mortar). With his future in flux, Taymor contacted Dinelle Lucchesi (head of underground social club Anthrob Dimurtica) and the two decided to start a restaurant in LA, almost on a whim. They had actually met on a flight when the Chef was still at Saluté, and had collaborated before on a dinner party for Anthrob. Lucchesi, for her part, runs the front-of-the-house for Alma, and previously worked in public relations and journalism in New York. The two are joined by Chef de Cuisine Derrick de Jesus, an alum of Patina and The Ritz-Carlton who also staged at Mexico City's famed Restaurante Pujol and competed in the Coupe du Monde de la Pâtisserie in Lyon, France. Meanwhile, Ramen California alumnus Chris Yamashiro (who I actually met at Wolvesmouth event earlier in the year) heads up the beverage program. 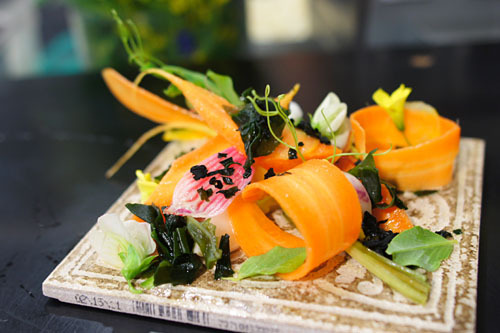 We began with a beautifully composed plate of raw and whey-poached vegetables, the Chef's riff on the classic appetizer of crudités. Each veggie was celebrated here, distinct in essence and true to form, making for a mélange of disparate flavors: sweet, tart, and bitter. I especially appreciated the rich, ocean-y smack of the seaweed, which, in concert with the uni-bottarga vinaigrette, added considerable depth to things, and served as a sort of foil to the otherwise light, bright tastes at play. Next up was Alma's signature starter: a beignet of tofu and seaweed, evolved from a dish that Taymor used to serve at Saluté. It was hot, hearty and satisfying, with a blend of savory, tangy, and subtly sweet flavors deftly moderated by a base of tofu, all with delicate overtones of piquancy from the yuzukosho. 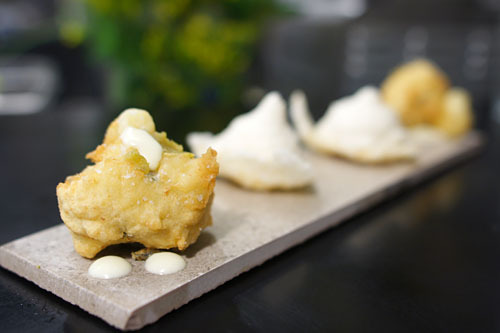 Accompanying the beignet was a delightful onion chicharrón, crisp and crunchy, with a tasty onion-y sweetness tempered by a lush dollop of silky, smoky crème fraiche. 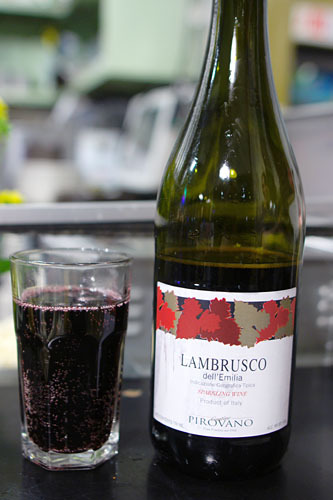 Taking advantage of the BYOB policy, we popped open a bottle of Cantine Pirovano Lambrusco, from Italy's Emilia-Romagna region. This was a bit more substantial than your typical sparkler, but was still gluggable, with a jammy, off-dry sweetness and just a touch of booziness. Summer squashes of the yellow and zucchini varieties were showcased here in tremendous fashion. Shaved strips of the stuff were light, bright, and crisp, perfectly contrasted against the creamy, saccharine weight of the ricotta as well as the superb, salty twang of guanciale. 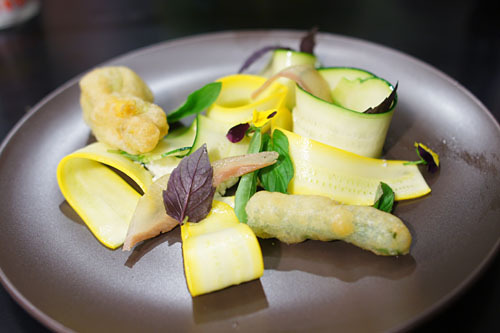 I loved the fried squash blossoms as well, with their delectable savoriness and crunch, while the herbs employed provided an overarching mintiness to the entire dish that just tied everything together. This next course, my favorite of the evening, reminded me of a Brassica dish that I'd had last year at Saison, though taste-wise, this was a pretty different animal. The star of the show was clearly the veggies, wonderfully crunchy in texture and bursting with green, bitter, astringent, aromatic flavors that I adored. 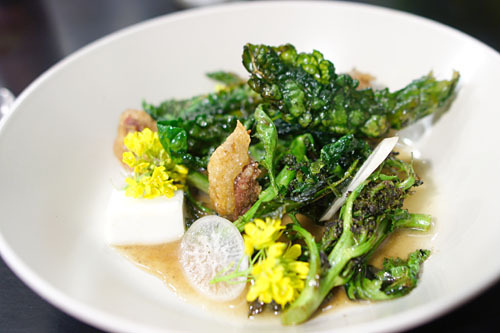 The Brassica was duly heightened in richness and body by the almost profound weight of the duck consommé, as well as the fried shards of duck skin, while the daikon added a touch of lightness to the mix. 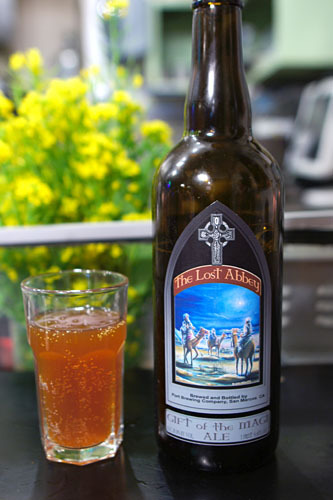 With the Lambrusco exhausted, it was time to move on to beer, specifically the Lost Abbey Gift of the Magi, a Christmas bière de garde replete with frankincense and myrrh (no gold, though). This was a tasty, multifaceted brew, dry with a fruity, malty sweetness and marked spice, all rounded out by an earthy, weighty funk. 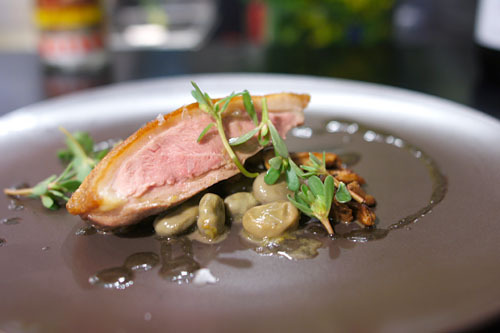 Our pièce de résistance, so to speak, was a gorgeous cut of Muscovy duck from a producer of Jidori chickens. The bird was cooked spot on: tender, meaty, and brimming with succulence. Its flavor was just as incredible, with an amazing depth and intensity, and just boatloads of duck-y relish, all augmented by the earthy character of the chanterelles and the heady black olive oil. As tasty as the meat was, the long-cooked fava beans and purslane were crucial as well, supplying a well-placed bit of levity to the fray. At this point, we were provided an intermezzo courtesy of Chris Yamashiro, who, I'm told, oft takes inspiration from the great Matt Biancaniello. 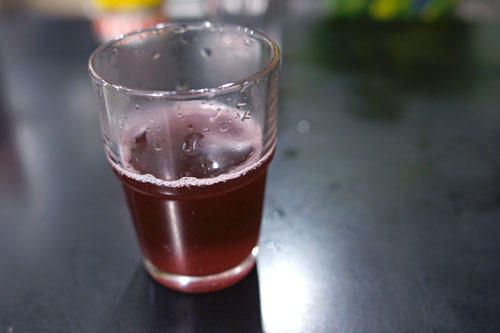 He presented here what basically amounted to an agua de Jamaica soda infused with habanero chile. It was an intense and effective palate cleanser, leaving my tongue tingling and obliterating any hint of the preceding duck with its combination of sweet floral flair and creeping, lingering heat. 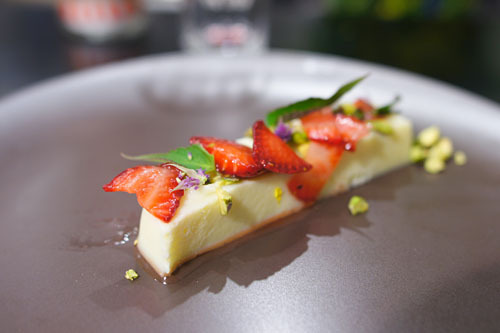 For dessert, a lengthy cuboid of trembling milk curd conveyed a light, lactic sweetness, a fitting counterpoint against the fruity, unabashed sugariness of the strawberry. Candied pistachio, meanwhile, added a lovely nuttiness to the dish, and I thoroughly enjoyed the herbaceous pricks of pepperiness from the anise hyssop as well. 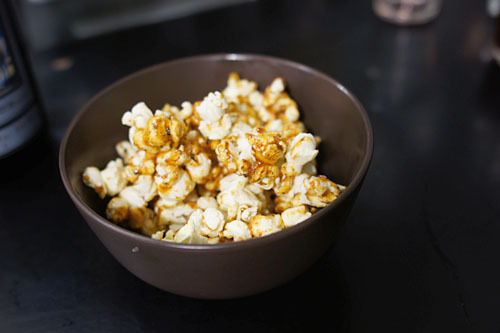 To close out the meal: a bowl of shichimi togarashi-dusted kettle corn perfectly blended the caramel-y sweetness of the popcorn against the heat of the Japanese spice blend. 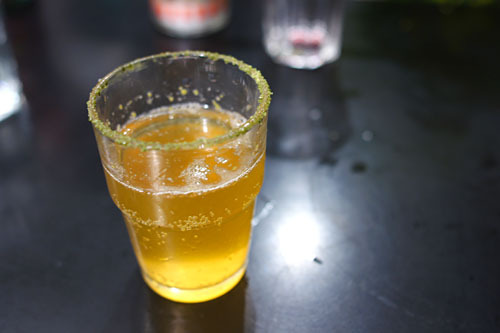 It was joined by Yamashiro's excellent wasabi salt, yuzukosho, and lemon Kirin michelada, which displayed a fantastic interplay between salty and spicy flavors, all moderated by the beer. 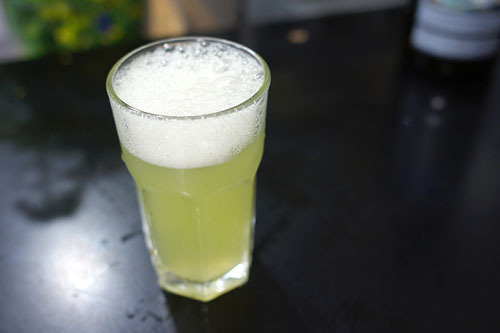 An unofficial addition to the menu: Yamashiro's experimental bay leaf soda. 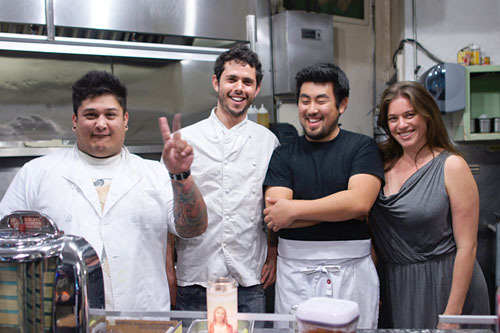 The Alma team: Derrick de Jesus, Ari Taymor, Chris Yamashiro, and Dinelle Lucchesi. I didn't know quite what to expect when I walked in to Alma, but what I experienced was impressive to say the least. Taymor's food, perhaps not surprisingly, shows a strong Bay Area aesthetic, which is a breath of fresh air to LA's current culinary landscape. His flavors are laser-focused, yet uncompromisingly inspired and evocative, joined by thoughtfully composed, organic plating and presentation. Though the Chef is young in years, he's demonstrated a certain maturity and point of view that I can't help but appreciate, and I expect some great things from him--he's one to watch for sure. Alma pop-ups will continue until the team has enough money to start a permanent project in the Hollywood/Los Feliz/Silver Lake/Echo Park area. I suggest you give them a try. Please, do tell me more about this "stir."